The length of multiple football fields end to end, and with ceilings as high as ten stories, an aircraft hangar might house hundreds of millions of dollars’ worth of aviation assets on any given day. When a client expresses a need for his or her hangar to be flexible enough to store different types of planes on different days, for example, two wide-body Boeing 777s on Monday and five small regional jets on Friday, the firm may offer an option for a long span hangar, the “open concept” of aircraft hangars, where designers minimize the use of support columns for an unobstructed, flexible space within. Any hangar with a clear span greater than 250 feet of columnless space classifies as long span, but FSB has also designed hangars with more than 500 feet between columns. Determining whether a hangar needs to be long span is one of many decisions through which FSB guides its clients during the design process. A need for flexibility leads some clients to long span design, and each owner brings a unique set of additional requirements to their hangar project—geographic limitations, type of maintenance, timelines, budget, height restrictions, access to materials, potential expansion needs, to name a few. Each requirement plays a role in driving the final design, McNayr said. When a major United States airline approached the firm with a project to design a hangar in Brazil, the airline knew it would need to be long span. Budget and timeline were also major considerations that influenced the design. On top of this, the materials and construction techniques dictated in the design would need to work with local building codes, customs and available resources. Koo also based his design upon the sizes and connection types customary in Brazil in order to keep costs down and make the structure easier to build. He said FSB researched the local building codes and hired a Brazilian architectural and engineering firm to assist them in understanding customs, techniques and available materials. As a company accustomed to working in other parts of the world, this type of cultural research and local partner work is often part of FSB’s process. In this case, the local firm will finalize FSB’s concept and prepare more detailed construction documents based on the design created by FSB. To honor the owner’s budget and timeline constraints, Koo also incorporated pre-engineered metal building components into the design where possible to save time and money during construction. 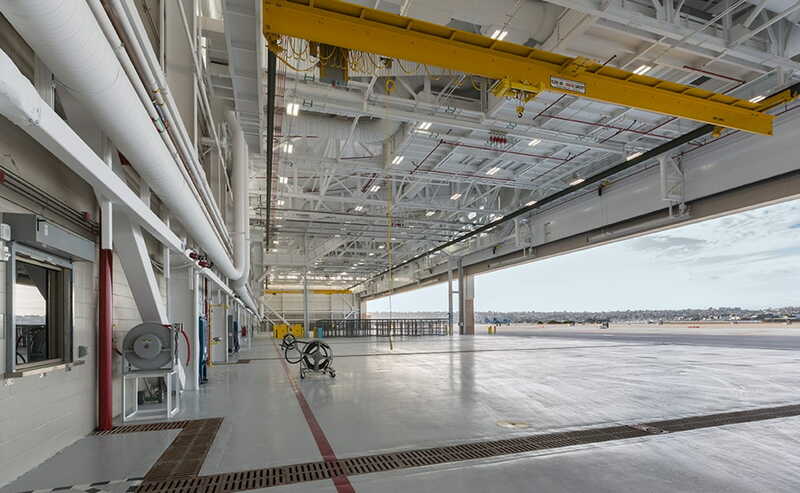 When the North Island Naval Air Station needed a helicopter maintenance hangar built for its Pacific Fleet, the Naval Facilities Engineering Command knew flexibility would be paramount. Structurally, the North Island’s soft soil combined with the area’s frequent seismic activity made for an engineering challenge. For a site location visible from the San Diego Bay, the base commander said aesthetics were also a priority—it would need to be unique and beautiful, not a box. North Island Naval Air Station is known as the birthplace of naval aviation, and the final design needed to live up to this heritage. To structurally stabilize the hangar, stone columns were placed into the soft soil as a foundation. 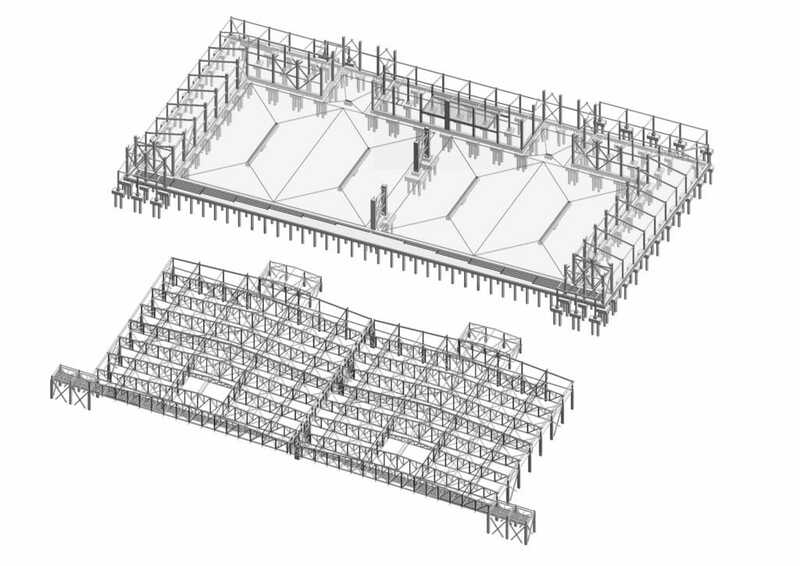 Specialized bracing systems and shear walls were applied to ready the building to withstand high seismic forces. For his structural team’s creative solutions to the site’s particularly challenging geography, FSB received the 2014 Excellence in Structural Engineering Award – Outstanding Project from the National Council of Structural Engineers Associations. Clients working with FSB soon discover they are in adept, knowledgeable hands. The firm’s 65 years of experience designing hangars combined with their in-house architectural, civil, structural, mechanical, fire protection and electrical engineers make for a nimble, sizable team able to produce excellent, well-coordinated work between disciplines on a tight timeline. For Koo, the motivation is simple. Interested in learning more from the aircraft maintenance facility experts, contact Laure Majors at busdev@fsb-ae.com or call her direct at 405.840.2931.